Know precisely what you want and identify your target. Have clear key points of what you want to achieve through your advocacy effort and keep it simple (aim for no more than 3 goals; although 1 is even better).Be as specific as possible – rather than advocating for ‘more investment’ in a particular area be specific about what this might like look, i.e. how much of an investment and in what form? Research who it is you need to know (i.e. who can make change happen) and who your target/audience will be.Get to know your target/audience by gathering some background information. Understanding who you are advocating to will assist in identifying the best approach and also the type of language that you should adopt. It is also crucial to understand the system and to know what your target is able to deliver. Timing is also crucial. You should plan how and when you will time your advocacy efforts but you should also be responsive. For example you might respond to an issue which is gaining media coverage, or capitalise on opportunities such as an upcoming election. Tell stories. No, not ‘stories’ as in fictional tales. Rather, gather real life stories from the people who are experiencing the issues first hand. There is a special power attached to people sharing their stories and ‘getting personal’. Telling people’s stories can considerably strengthen your advocacy effort. Such an approach also enables those closest to the cause to have their voice heard in matters that directly affect them. 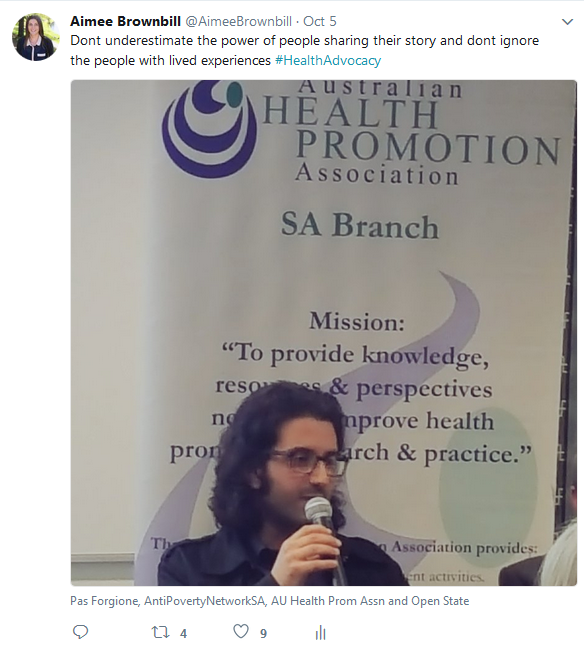 Pictured: Pas Forgione – Coordinator of The Anti-Poverty Network SA. Engage with the media. Some of you might cringe at the thought of this, but our panel members were clear on the significance of the media in achieving advocacy success. Their advice: be strategic by developing close connections with trusted media Identities. Remember that the media always has a story to tell, why not let it be yours? More importantly, if you are telling the story, you can provide balance to the discussion so that the opinions of those holding opposing views, or who are potentially less (or not at all) qualified, will not dominate the discussion. This is important because politicians tune in to what is being discussed in the media. At the same time, we must be cautious in our dealings with the media and should ensure that our views and positions are accurately represented. Unnecessarily ‘peeve off’ your audience. Making subtle (and of course direct) insults is a sure way to not have your cause addressed (i.e. ‘you refused to see me previously’ or ‘you clearly do not care about this issue’). Nor will the use of threatening language. Remember to have common courteously and respect; politicians are people too (very busy people)! Also keep in mind that there is a small degree of separation (especially in a tightknit SA community!). Ensure that you are professional at all times to help build a base of credibility. This will ensure that you are considered more of a resource than a nuisance. Don’t be afraid to put yourself out there – practice makes perfect. A useful tip is to go and speak with those who you know are already on your side/those who agree with your cause. Panel member Mark Parnell referred to these as opportunities for ‘cuddles’. Like a cuddle, meetings with trusted allies can leave you feeling more comfortable and confident in your advocacy approach. Having opportunities to practice advocacy in a supportive environment, whilst being open to constructive feedback, is a great way to maximise your impact. Panel member Ian Cox also highlighted the need for us to embrace failure – he encouraged us to try ‘flearning’ once in a while. Don’t give up. Working in advocacy is a long and hard road. Your goals are often long-term and it can take a long time to see the kinds of results you are striving for (think about how long it took those working in tobacco control advocacy to start seeing results!). However, it is important to stay in-tune with your passions and remember why your cause is important. Learn to celebrate the small wins as these bring you closer to your end goal. Work as a collective. Together we can make more of an impact. We can be more strategic and can add more voices to a cause. Who can you or your organisation partner up with to progress your cause? It’s a two-way street. Politicians want to be able to connect and communicate with you too so be sure to provide them with a way to do so (i.e. by address, email or phone). Be sure to put yourself forward as a resource too- this can build a reciprocal and trusting relationship. It is also important to consider what they might need, or what their current focus is. By understanding these factors, you can position your cause alongside their interests/pressures. This makes it easier for them to respond to your call for action, thus increasing your chance for success. Positions can change. A leopard can change it’s spots and sometimes it also needs to recognise the presence of its own spots. Approximately 20% percent will strongly support a cause while another 20% will oppose it. This leaves 60% of opinions you can work on influencing. And remember, when you are advocating for politicians to make courageous decisions, it is important for them to know they will have people/organisations that will publicly support them in these decisions. 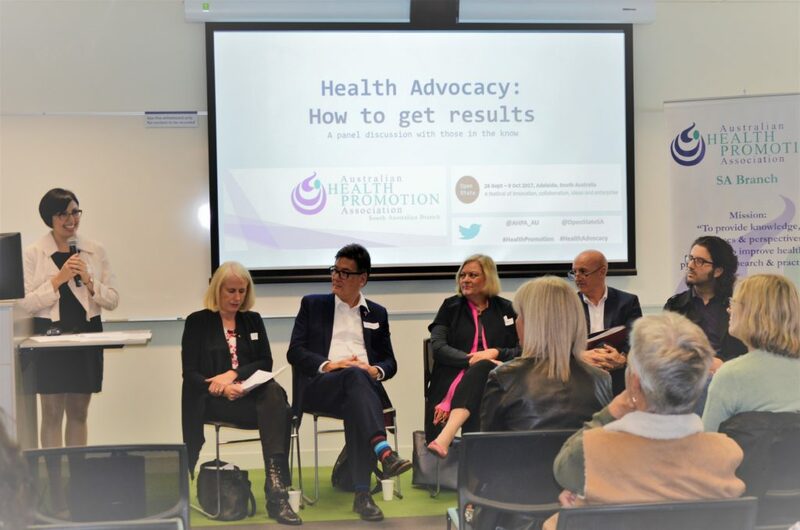 In October AHPA SA hosted an Open State Event on ‘Health Advocacy: How to get results’. We had a fantastic line-up of speakers: Mark Parnell (Leader of the Greens, SA Parliament), Rev Peter Sandeman (CEO, Anglicare SA), Professor Fran Baum (Foundation Director, Southgate Institute to Health), Dr Jennifer Bowers (CEO, Rural and Remote Mental Health), Ian Cox (CEO, The Hutt Street Centre) and Pas Forgione (Coordinator, The Anti-Poverty Network SA). We have combined a summary of key points discussed at the event to help you in your future advocacy efforts. Have a look at #HealthAdvocacy and @AHPA_AU for more tweets from this event. Thanks to those who tweeted which helped guide our summary. Pictured left to right: Dr Stefania Velardo (APHA SA President), Professor Fran Baum, Rev Peter Sandeman, Dr Jennifer Bowers, Ian Cox, Pas Forgione. The Australian Health Promotion Association is the only professional association specifically for people interested or involved in the practice, policy, research and study of health promotion. One role of the Association is to advocate within this space. At a State level, the AHPA SA Branch also actively engages in advocacy efforts. 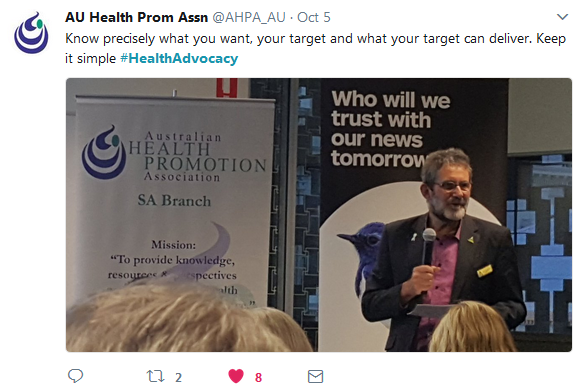 Currently the AHPA SA Branch is working on progressing our advocacy agenda for the upcoming 2018 South Australian State Election. You can read our open letter here. At AHPA SA, we will be engaging closely with our members in the lead-up to the election. 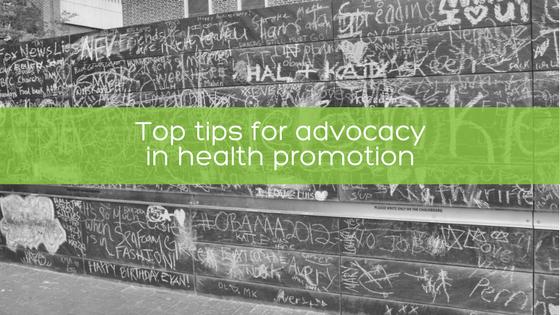 If you would like to join in our advocacy efforts, with an emphasis on getting health promotion and prevention back on the South Australian agenda, be sure to sign up soon. All members will be notified about ways they can support our advocacy efforts over the coming months, in the lead up to the 2018 State Election. AHPA SA would like to thank those who attended the event and participated in discussions along with our amazing panel of speakers. We would also like to acknowledge the efforts of the Branch Committee in organising the event, with a special thank you to Shelley Ratcliffe and Sally Modystach for leading the organisation of this event. Lastly, thank you to the South Australian Government for incorporating our event in the Open State Festival program. Great sharing your valuable thoughts Aimee and Stefania. Your advocacy can reach to many of your readers that can easily accessible through online platform. Easy to follow topics, very engaging.